Trish and I aren’t the only ones impatient for our bikes to arrive. After all, we originally hit on the idea of cycling because of our dogs. To be accurate, it was mainly because of Cézanne, our 18 month-old sprollie (springer spaniel x border collie). He has enormous energy. Our regular walk down the local voie verte only gets him warmed up. Trish figured that, if she could cycle, then she could take him further in the time available – we’re working people, after all. 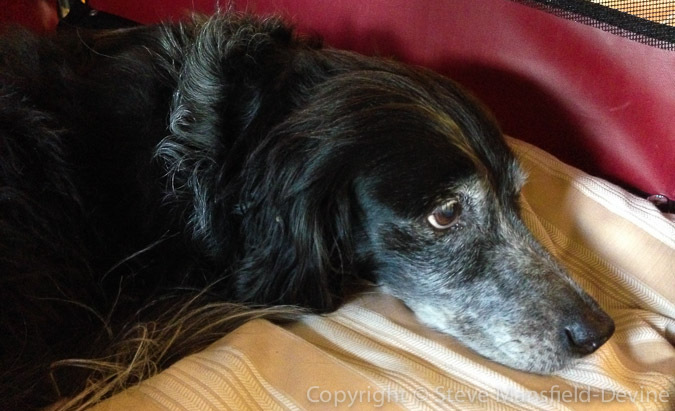 But that raised the question of what to do about Zola, our (mostly) Breton spaniel who is fast coming up on his 15th birthday. These days he mostly trots along keeping pace with us, never venturing too far away because he’s deaf, half-blind and has a heart problem, all of which makes him feel vulnerable. Enter the DoggyHut. 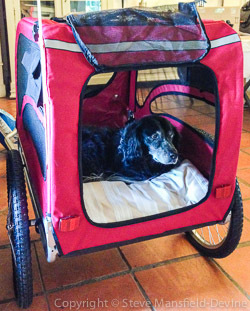 With a dog trailer, Zola can ride most of the way, just running a few klicks to get his daily exercise. Our one concern is whether he would take to it. Would he tolerate being in that confined space? The day the DoggyHut arrived, we hadn’t even got as far as putting the wheels on before Cézanne tried it out for size. Once it was completely built, however, Zola cast his one good eye over it and decided, ‘That’s mine’. Since then, he’s been in it every chance he’s had. We deliberately left it in the living room so that he could become accustomed to it. And while he already has half a sofa and two armchairs dedicated to his comfort, he mostly chooses the DoggyHut. 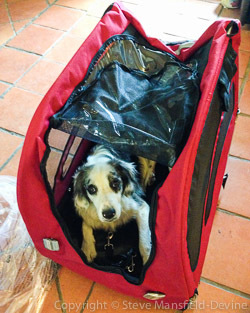 We’ll write a full review of the DoggyHut once we’ve had the chance to use it in action. We’ve made one small attempt to use it: we wheeled the trailer outside with Zola in it (but not shut in – the front flap was open). And I hitched it up to one of the old bikes we have hanging around. He seemed very happy being transported across the garden. It wasn’t until I hit a big bump and stopped that he jumped out. And even then I suspect it was mostly to inspect a rabbit trail. So we have high hopes for the trailer. And when Zola has moved on, it will allow us to cycle distances greater than we can reasonably expect Cézanne to cover on foot.